It was another cold, though less snowy, week here in the Great White North. I’ve noticed the days getting longer with the sun coming up earlier and setting later every day. I finally believe that spring might be coming, though I suspect we won’t see the earth under its multi-foot layer of snow until after spring’s arrival. The idea of a pot of fish soup was a welcome antidote to the chill in the air. I could get excited about an imaginary dinner on the French Riviera. I made a grocery list and went to pick up what I needed. I was envisioning a fragrant tomato broth with other Provençal flavors like fennel, orange peel, and saffron. I was also anticipating spoonfuls of fish chunks surrounded by this lovely broth, but wait… The path to dinner was much different than I expected. It started at the fish counter. Wegman’s has come to town (the next town, actually). I’m trying hard to like it and haven’t given up yet, but each visit I leave feeling like it fell short. Their produce is a nightmare, and their precut fish has been a disappointment because it always looks hacked into the pieces for sale. One thing I’ll give Wegman’s props for is the display of fresh whole fish on ice at the fish counter which I don’t see everywhere. I was in search of a whole red snapper, so chose to shop there again. They didn’t have red snapper, so I opted for two ocean perch. The fish guy scaled them for me, and offered to fillet or whatever else I wanted to the fish, but I thought I was cooking them whole so declined. 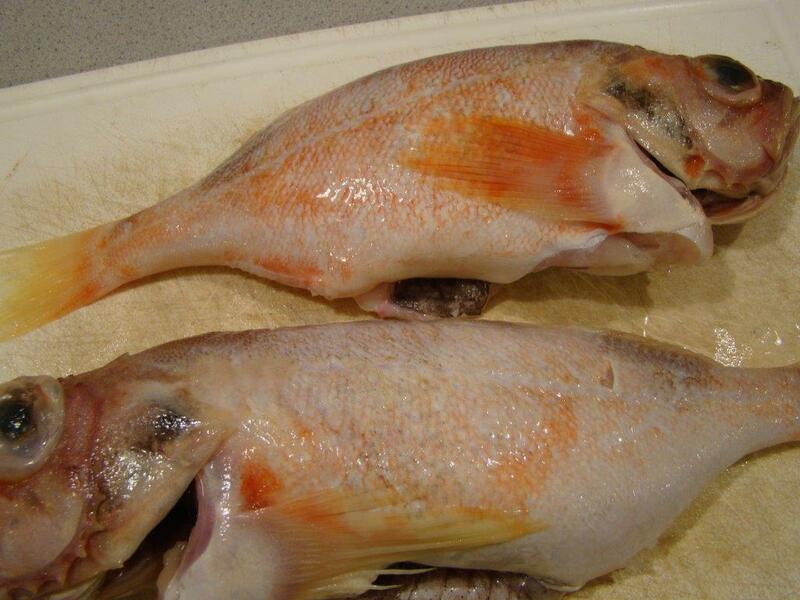 Ocean Perch — Aren’t they ugly? At home, I finally read the recipe through. 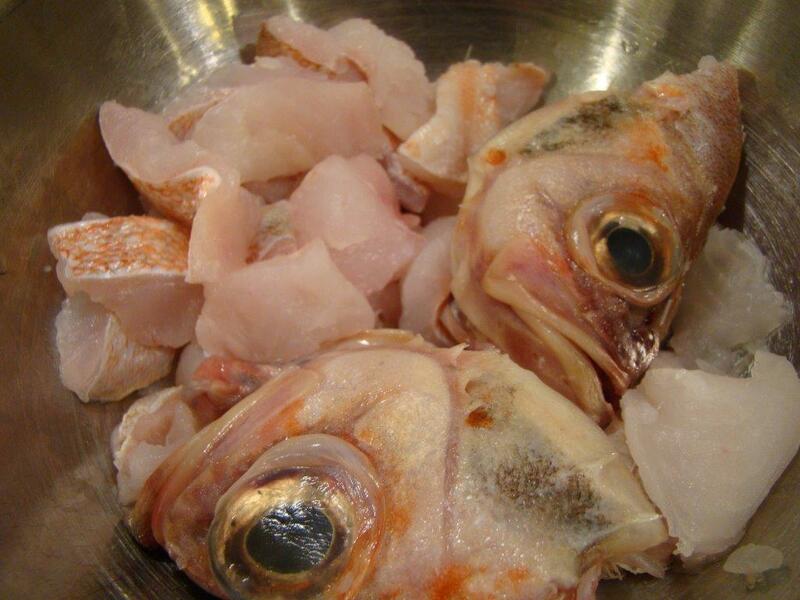 I realized that after I cut off the heads, the fish needed to be cut into chunks. I guess I could have had the fish guy bone the fish for me. Oh well. I googled what to do and did it myself. It didn’t seem like I was supposed to add the bones to this soup, so I froze them for fish stock another time. The remaining steps to make the soup were mostly easy and “the usual”. Vegetables are sautéed. The fish gets added. Liquid is supplied from chopped canned tomatoes and its juices plus water. 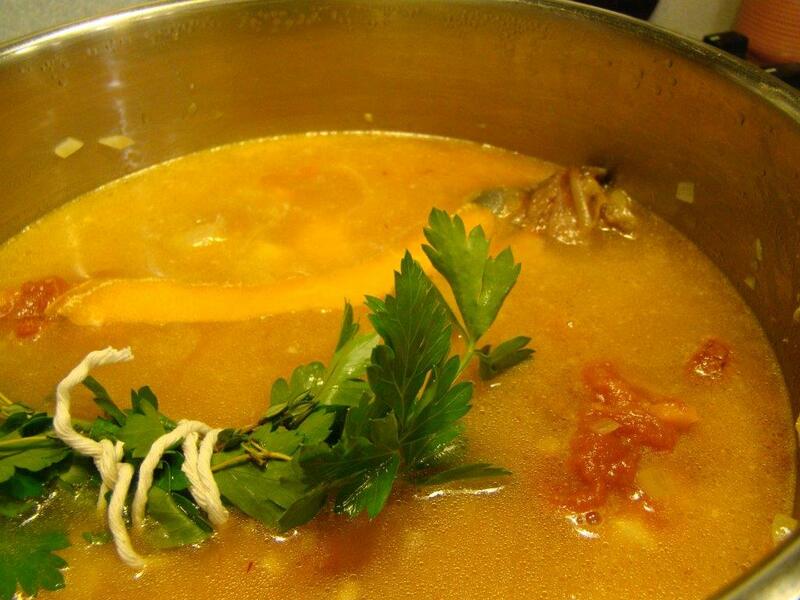 Herbs, orange rind, saffron and Pernod (pastis, an anise liqueur) provide the seasonings as the soup simmers. The final surprise was the food mill. I was honestly confused by the concept of all of these ingredients being processed into a fishy puree. I did it, particularly because miscellaneous bones made their way into the pot, so this step made it easy to get rid of them, but it wasn’t what I expected. In the end, I liked the flavors of the soup. Because of my original idea of what the soup would be like, the smooth texture threw me. I was OK with the broth having substance instead of being a clear broth, but I prefer fish chunks on my spoon instead of hiding in the soup. Upon rereading the recipe, I see that Dorie thinks the fine shreds of fish in each spoonful is more satisfying, for my taste, I disagree. If I make this again (which I might) I would cook everything except the fish chunks, puree that, and then cook the fish in the pureed soup. Without a doubt, my favorite part was the toast with rouille on top. I could easily just eat the garnish without the soup. Fortunately, there’s still plenty left! To see how the other Doristas fared in this last installment of “French Fridays” Fish Month, check out their links here. We don’t post the recipes for this group, but you can find it in Dorie Greenspan’s book Around My French Table. Posted on 27 February 2015, in Fish, French Fridays with Dorie, Soup and tagged fish, French Fridays with Dorie, provence, soup. Bookmark the permalink. 17 Comments. Betsy, I really like the idea of cooking the fish in the milled soup. Thanks! Initially, I thought the texture was fine and my husband complained it was a bit icky, but the second time we ate it, I had come around to his point of view. 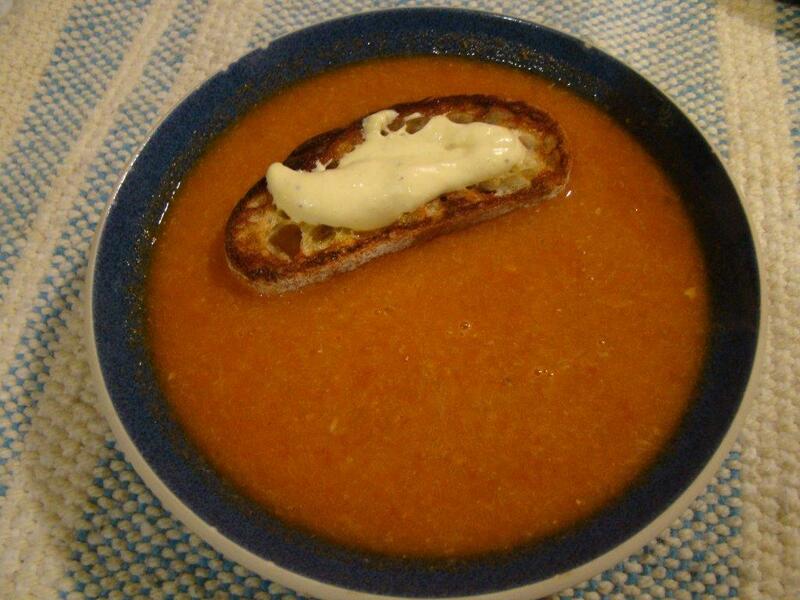 Great post and the soup looks delicious! I go to a Wegman’s when I visit my husband’s father in Virigina. I think the lay out is a nightmare… designed to have you wander. Don’t love the place, can’t get in and out. Nice lunch area. When I read the original recipe I found pureeing it odd. I’ve never seen a Riviera Fish soup that was pureed. Try it again with out that step. I think you will enjoy it more. Now you have me wondering if I did it wrong because my fish was cooked with the bones and then put through the food mill to get rid of them. I loved the end product, but the food mill was a nightmare and I agree that I might have liked it better a bit chunkier. My thought for next time was to ask the fish guy to fillet the fish for me, then give me the skeleton to throw into the pot (maybe in cheese cloth if it looks too fragile) so that it can add flavor but I can easily fish it out at the end. Looks interesting, as always your blog is wonderful and so informative. I did not know we had a wegman’s ( in Burlington I am guessing). I am on vacation will try to catch up on this when I return! Hi Betsy, Always interesting to see your assessments on what you’ve cooked for the week with the Dorista’s. I’m thinking I may have preferred a chunkier dimension too, but then I like to load up my bouillabaisse with lovely fish. I admire you even making your way to the next town in this bitter cold, a huge effort! Thanks for sharing. See now I read the recipe as you put all the fish in, bones and all, and milled them out. Glad you enjoyed and yes, I agree those toasts don’t need soup to shine! First, may I say once again, think about California next Winter. Next, Polly and Paul Perch’s eyes are a bit off-putting. Did you put them in the soup? I always like chuncky and thick over thin. Just seems more filling. I think I’d go for the toast with the delicious spread. I used snapper filets for this soup and then threw it all into my blender. My soup came out thick and quite delicious! My hubby suggested to buy some crab meat and serve it on top…I did that the second night…loved it! Sorry this one wasn’t a winner! Stay warm Betsy!! You did a much better job dealing with your whole fish than I did. Maybe my knives need sharpening, but I think it was more likely user error! I didn’t mind the pureed soup at all, but nice fish chunks sounds just as yummy! P.S. I’m loving the longer days! Whew! Feast of 7 fishes is enough for me. 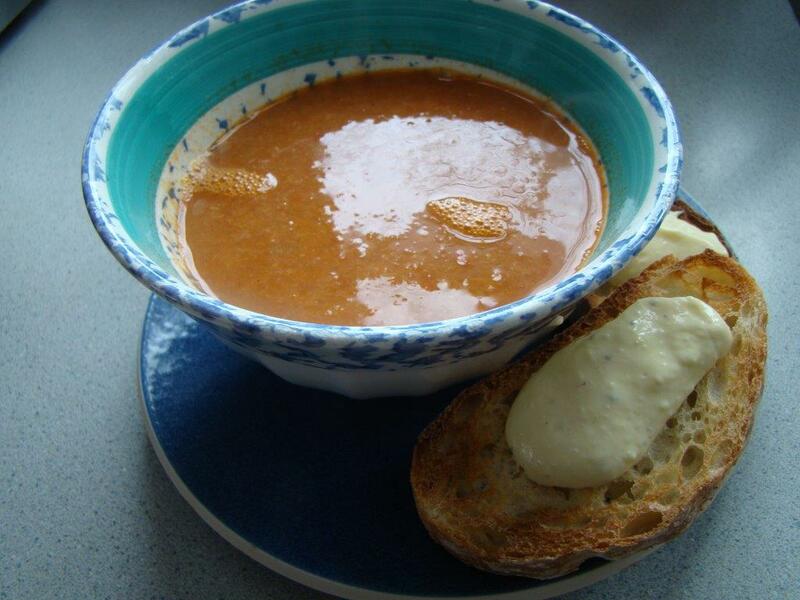 Your soup does look inviting with the rouille and toast on top. Have a great weekend. You know what, Dorie’s Mayonnaise recipe didn’t work for us, either. I wonder if there’s something wrong with the recipe. We tried it a long time ago and I just wrote “didn’t work” on the page. We’ve had success with other recipes, though. You’re brave using the whole fish – I think I could have dealt with that far easier than pureeing the soup – I don’t know why I had a problem with that, but is seems I wasn’t the only one. You & Howard will definitely have to come out next year while Mary’s here! You can stay with her for a few nights, then with us. Stay warm! Like you, I assumed I’d be cooking a whole fish, so that is what I bought. Yikes! My supermarket didn’t even scale the fish, so Wegmans sounds like a step above them. I liked the flavour but not the texture of this soup; I didn’t strain it because mine was so thick that I feared I’d end up with nothing. Glad you enjoyed it. Wow- gold star efforts all around. I give you a ton of credit for the whole fish, mayo and endurance. Funny about Wegmans too it had almost a cult following in our community when they opened a branch. Switching to any new store tends to have me dislike it because I have to learn the aisles but my mother in law “flies the Wegmans flag” as our family says and raves about it to company. Nana and I have found it pretty darn handy with some of the FFWD ingredients so I was actually quite surprised that they didn’t have the red snapper. I headed to my new closer grocery store knowing I had no chance. I didn’t make the toast and topping in time to post but told Pete we were definitely going to have it since folks raved about it. Guess I better get moving before the bread is too stale – LOL. Stay warm !! I am amazed at all you Doristas that have battled the whole fish. This recipe was more than I could handle. I was happy with my make-up. I hope Spring comes sooner rather than later for you. We are enjoying some more rain in CA! This was definitely an adventure! Is your go-to mayo recipe online somewhere? I would love to give it a try after my failed attempt using Dorie’s recipe. It doesn’t seem to be on my blog. And I can’t find it on-line. Do you have Mark Bittman’s “How to Cook Everything”? That’s the recipe I use. If you don’t have it, let me know. I’ll email it to you. Thanks! I have the “How to Cook Everything” iPad app, and the recipe is there. I will try that one next time!